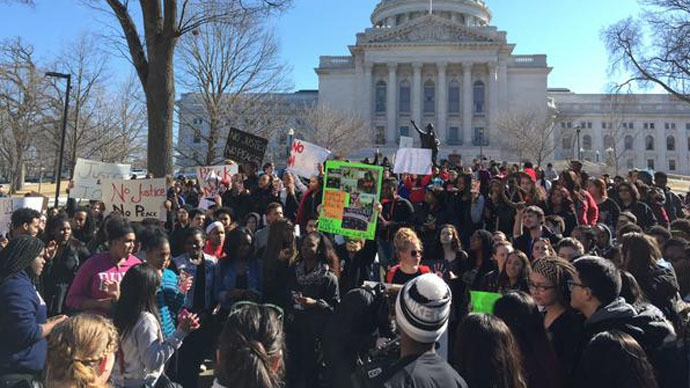 Protests over the death of an unarmed black teenager shot by a police officer in Madison, Wisconsin continued for a fourth straight day as students at the state’s flagship university walked out of class to attend a rally at the State Capitol. A march began at Madison East High School and closed six lanes of traffic on a major city street as protesters walked to the State Capitol building for the noon demonstration. The group included about 100 students from the University of Wisconsin-Madison, who walked out of class at 10:30 a.m. local time. High school students also joined the march, the Wisconsin State Journal reported. Madison Mayor Paul Soglin addressed the crowd outside the Madison City Hall. “I am sorry,” Police Chief Mike Koval told the demonstrators. Protesters sitting in the streets asked for food and water on social media. Police presence in the Capitol building was “barely seen,” which is “different from a typical protest,” Milwaukee Journal Sentinel reporter Jason Stein tweeted. The demonstrations began Friday night, after veteran Madison police officer Matt Kenny, who is white, shot and killed Tony Terrell Robinson Jr., an unarmed 19-year-old black man, around 6:30 p.m. that evening. Kenny was responding to reports of a man jumping in and out of traffic, creating a safety hazard, Police Chief Mike Koval stated. Kenny followed the suspect into an apartment and forced his way in because he heard a disturbance. 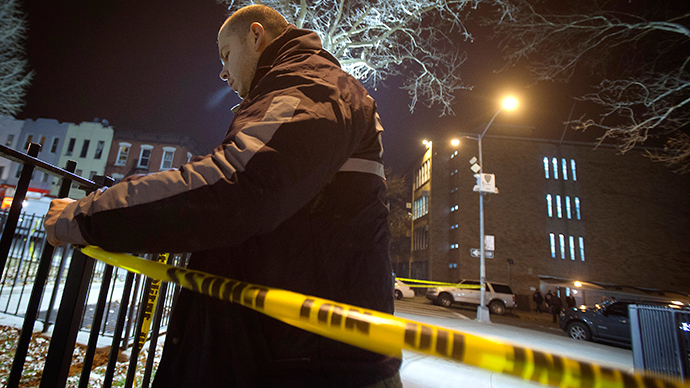 The man was injured by gunfire in the ensuing fight, the chief said. Koval stressed the officer immediately began to administer first aid, as did other officers who arrived at the scene. However, the man died in a local hospital. "He was unarmed. That's going to make this all the more complicated for the investigators, for the public to accept, to understand... why deadly force had to be used," Koval said of Robinson. The department said Kenny would not have been wearing a body camera, according to Fox News. The Madison police chief apologized to Robinson’s family in a blog post. "Certainly, this will not take place soon given the circumstances. It may take some time for this loop to close but I pray that it will, in fact, close," he added. But the apology did not placate protesters. "There's nothing the chief can say short of changing the system," Brandi Grayson, a leader of the Young, Gifted and Black Coalition in Madison, told the Associated Press. She added that Koval "had a perfect response – perfect for white people." The coalition is demanding that the city pay for Robinson’s funeral and any costs associated with the family’s healing process, USA Today reported. Koval asked the protesters to show restraint, Vice News reported. "It's understandable that the reaction seen among some of our citizens is extremely volatile and emotional and upsetting, it's absolutely appropriate in this circumstance," Koval told reporters. "We would urge that everybody exercise restraint and calm." According to 911 dispatchers, Robinson was acting violently and hitting people around him. "Apparently Tony hit one of his friends. No weapons seen," a dispatcher said on 911 audio obtained by WKOW. About four minutes later, he said: "I got another call for the same suspect at [the same address]. He tried to strangle another patron." About 30 seconds later, an unidentified officer said, "Shots fired, shots fired." That commotion is what led Kenny to enter the apartment, Koval said.